is the creator of Sacred Movement Ritualtm, a series of nine contemplations in movement. 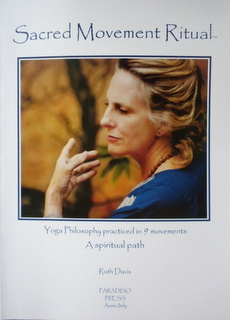 Ruth, a devotional dancer from childhood has been teaching movement as a spiritual practice since 1985. It is a culmination of her life's journey of professional dance, eastern philosophy, devotion and Chi Gung. She invites people to experience the spiritual wisdom that can be found within basic movement. Having studied Chi Gung Ruth found the essence of the teaching as a deep connection to nature and oneness. Moving with nature we learn to move at the pace of peace. She dedicates her dance / movement to Divine Love. Sacred Movement Ritual is a series of 9 meditative movements. The movement lessons or phrases are a complete practice in themselves. As we practice them they reveal profound spiritual truths. One movement follows the other, in a fluid Tai Chi style of movement. Contemplations accompany each movement to create a rich understanding of the lesson. The sequence is original and unique. All movements are done in, from and through the heart. A natural sense of peace and well being develops with daily practice. We begin to feel connected to the rhythm of our own life and the rhythm of the universe. During the practice one senses beauty, oneness, expansiveness, and a quieting of the mind and body. This book explains the contemplative practice underlying the movements. The movement phrases are spiritual lessons based on the meditation practices found in Christianity, Hinduism and Buddhism. The mystic meaning of movement is revealed and connects us to the oneness of nature and the infinite love of the Divine Mother. Movement can be a healing practice, a mystical practice of removing internal obstacles so that we are released into Love. Subtle & gross movements of the physical body mirror inner states and awareness. We can use outer movement to explore, align and ascend to our highest spiritual potential. This beautiful flags are hand made by Ruth. The images of Mary are from all over the world. Feel the presence of the Divine Mother and let the wind carry Her love to everyone and everything !! 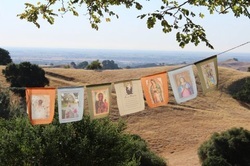 After years of devotion to Mother Mary I was inspired to create these beautiful Prayer Flags. They are images from Mary Shrines that I have visited and from a grotto I made in Assisi, Italy.